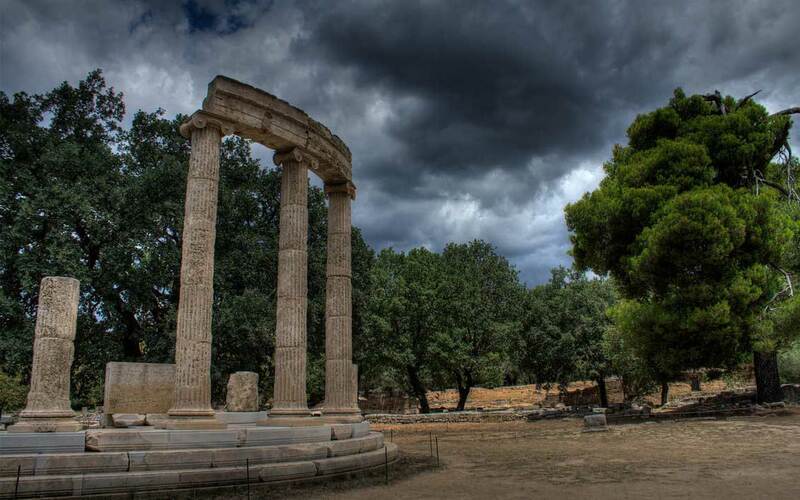 The renowned sanctuary of Olympian Zeus and birthplace of the Olympic Games lies in the north-western Peloponnese, in a verdant valley at the confluence of the rivers Alpheios and Kladeos, at the foot of the Kronion hill. The area cradled successive human settlements from the prehistoric era onwards, along with the primeval cults of deities and heroes, found at the core of the Peloponnesian mythology; thus, when Zeus arrived at Olympia around the 10th century BC, he had to displace his own father Cronus, Gaia (Earth) and Pelops, the mythical king of the Peloponnese (the very name of the peninsula meaning the island of Pelops), ancestor of Agamemnon and founder of the Olympic Games. Altis, the god's sacred precinct, was established as the major Panhellenic sanctuary throughout Graeco-Roman antiquity and up to its decline and final abandonment in the 4th century AD. The whole valley was named after Mt Olympus, the abode of Zeus, while every four years, beginning in 776 BC, it housed the Olympia, namely the athletic event that humanity nowadays celebrates as the Olympic Games. The Olympiad, the four-year period between two successive celebrations falling every fifth year, became a chronological measurement and system of dating used in the Greek world. The significance of the Olympic Games demonstrates the lofty ideals of Hellenic humanism: peaceful and loyal competition between free and equal men, who are prepared to surpass their physical strength in a supreme effort, with their only ambition being the symbolic reward of an olive wreath. The last Olympic Games of antiquity were held in AD 393, while the first Olympic Games of modern era revived in 1896 and were hosted in the Panathenaic Stadium in Athens. The archaeological site of Olympia yielded one of the richest concentrations of architectural monuments and works of art in Greece. The archaic temple of Hera and the classical temple of Zeus represent two milestones in the development of the Doric order from the 6th to the 5th century BC. The Treasuries (6th-5th centuries BC), several of which were built by distant Greek colonies, the Metroon and the Echo Colonnade (4th century BC), the Philippeion in honour of the victory at Chaeronea in 338 BC, and the Exedra of Herodes Atticus (AD 157-160) gradually added to the complex topography of the sanctuary. The density of buildings outside the Altis is even greater; the built-up zone includes officials’ quarters, lodgings and baths for visitors and athletes alike and of course the sports venues: To the north-west the Palaestra and the Gymnasium (3rd century BC), and to the east the Stadium highlight a landscape of ruins of majestic beauty. Flooding of the Alpheios carried the Hippodrome away: only its original location is known. In Olympia were discovered two of the most famous ancient statues, Praxiteles' Hermes and the infant Dionysus (4th century BC) and Paeonios' Nike (c. 420 BC), the sculpture that has shaped the iconographic allegories of Victory ever since. However, the most legendary treasure of Olympia is lost forever: the chryselephantine (overlaid with gold and ivory) cult statue of Zeus, one of the Seven Wonders of the ancient world. It was attributed to Pheidias, the great artist who also supervised the sculptural decoration in the Athenian Acropolis. The statue of Zeus rose to 13 m in height and was made by Pheidias in a purpose-built, on-site workshop. According to tradition, the statue was carried off to Constantinople where it was destroyed in a great fire in AD 475. In Olympia, half a century later, earthquakes devastated the ancient sanctuary and subsequent river floods and landslips buried its ruins until the archaeological excavations brought them to light again.